After living in the Bay Area for two years, I realized how crazy is was I still hadn't made the trip to Yosemite National Park, an iconic location many people travel thousands of miles to see. I booked a night at Yosemite National Park Hostel, picked out two long hikes to do, and was ready to go. I woke up Saturday morning excited and energized and was out the door by 5 AM. The drive (from Berkeley) went by fast and before I knew it, I was entering the park. I have never been so amazed at a park entrance before in my life. I was in awe. After staring at the view from Tunnel View for way too long (but not long enough) I knew I had to get moving. I prefer to beat the crowds wherever I go and starting the hike at 9 AM wasn't ideal for me. The hike I chose for my first day was the Mist Trail and it was AMAZING. 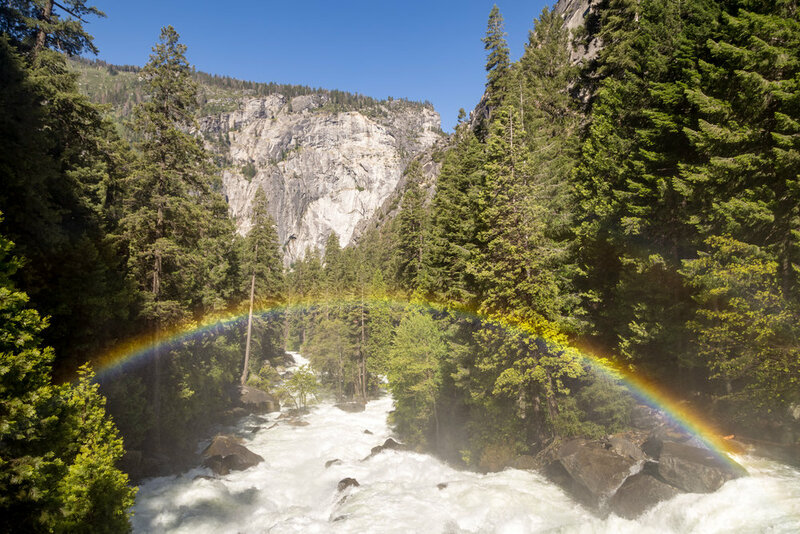 The Mist Trail is about a seven mile loop that runs along side of Vernal and Nevada Falls. I somehow managed to tack on a few extra miles and ended up with 190 flights climbed (thank you iphone). 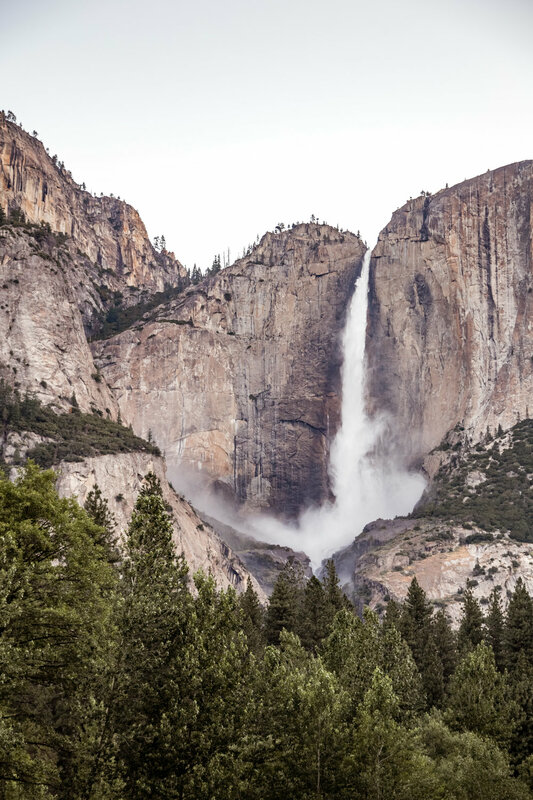 This trail is one of Yosemite's most popular trails for good reason. It was heavily trafficked until the top of Vernal Falls, then the crowds seemed to be dispersed. The majority of the day I had the trails to myself. Be aware, you will not get 'mist' from the waterfall, you will get drenched. I had to chuckle as I was going up the trail at people putting on ponchos, but joke was on me! When I return to this hike, I will most definitely bring a poncho. Once I reached the top of Vernal Fall (about an hour in) I attempted to let my clothes dry while I soaked in the scenery. Luckily I was there on a warm day or else it could have been quite unpleasant. From there the climb continued. The hike up to Nevada Falls was beautiful and pleasantly dry. The top of Vernal Falls had the most amazing view. I'm not one to be afraid of heights, but standing above the falls and watching the powerful water shoot past be and drop 600 feet - I was quite uneasy! I stayed at the top of the mountain and relaxed in the sun before moving on. I stayed along the 'Mist Trail' and hoped onto the tail end of the John Muir Trail to avoid getting drenched on the way back down again. I found it hard to leave the park so I stuck around watching the clouds evolve. Yosemite is a tough place to leave! It looked like a storm was coming in so told myself I had to take off to Groveland, my home for the night. After a tasty dinner at Cocina Michoacana and a nice night's sleep at Yosemite's International Hostel, I was ready for Day 2. Alarm was set for 4:45 AM Sunday morning and I was on the trail by 6 AM. Day 2's hike was Upper Vernal Falls. I knew it would be tough - and it was - but so worth it! Unlike the previous day, I was the one and only person around when I got started on the hike. About 30 minutes into my climb I had a minor bear scare, but it was just another solo hiker that snuck up on me. I was happy to see him...as the bear scare is the real deal. Upper Yosemite Falls and onto Yosemite Point, which I did, is a 9.4 out and bike hike with a 3,000 foot elevation gain. This hike is STRAIGHT UPHILL. I was glad I didn't know what I was getting myself into at the time - it would have made the feat that much harder to push on. But it was early and I was motivated so made it up to the top in pretty good time. The views of Yosemite Valley were breathtaking, and even more impressive when you look down and see how high you climbed. Of course, typical Lindsey fashion, I was unable to head back down at that point to I continued on to Yosemite Point and got myself lost for a while. No complaints though (not now anyways). Even caught some crazy guys walking on rope at the top! Yosemite Falls before the sun makes an appearance. After an amazing Yosemite trip, I bought myself a yearly pass because I knew I'd be back often. It took me two years of living in the Bay Area to make it to Yosemite, do yourself a favor and go visit asap!